Great Barrington's Mahaiwe Performing Arts Center presents music, movies and dance in splendid surroundings with a history. The Mahaiwe is also home to the digital telecasts from The Metropolitan Opera House in New York City. One month after the close of its 86th season, Jacob’s Pillow announces record-breaking ticket sales for its acclaimed summer dance festival. The organization reports over $2.5 million in ticket sales, an increase of 13% when compared with 2017; over 40,000 tickets were sold, an increase of 5%, when compared with last year. The season boasts 10,000 unique ticket buyers, an increase of 8% and the largest number since the organization began tracking this particular indicator in 2005. Arts leaders and the media met at Shakespeare & Company to hear good news about state and federal funding. With manufacturing long gone from the region cultural tourism is the major industry. The arts season attracts more than 400,000 visitors and generates 4,000 plus jobs. 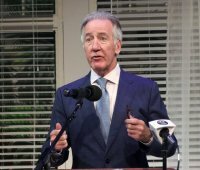 Congressman Richard Neal announced $348,000 in NEA funding for the Berkshires. The federal funding cycle provides $900,700 to the Massachusetts Cultural Council and $1,092,400 to the New England Foundation for the Arts to benefit cultural groups across the state. He reported that the NEA this year got an increase of $3 million for a total of $152,849,000. In recent years the Paul Taylor Dance Company has regularly appeared at the Mahaiwe Performing Arts Center in Great Barrington. It has been a decade since the company performed at Jacob's Pillow. For its 85th season the company was lured bac k for its 16th time. Add one more when in 1954, as a dancer, Taylor made his Pllow debut with Pearl Lang's Company. On this occasion the program featured three iconic works. The early music world comes to Boston every two years for the BEMF. This year its centerpiece opera was Andre Campra's "Le Carnaval de Venise," an opera-ballet, in its American premiere. It also reprised a hilarious pair of intermezzi, one of them the popular "La serva padrona," by Giovanni Pergolesi and Handel's Roman period oratorio "La Resurrezione." A good time was had by all. Campra's "Le Carnaval de Venise" sets the theme, but the weeklong festival ranges far and wide, from Mexico to Germany to Rome, Florence as well as Venice. Pergolesi's "La serva padrona"will feature local favorite Amanda Forsythe, and the BEMF orchestra will play Handel's "La Resurrezione." Something for everyone - everyone who loves early music that is. Every two years the Boston Early Music Festival schedules a week of concerts and operas that make Boston the world capital of early music. This year's focus was on Claudio Monteverdi, the first great opera composer. All three of his surviving operas were given stylish productions and featured some of the best singers of early music in the world. Taken from Greek myth and ancient Roman history, the stories resonate with the lives we live today. Biennial festival puts on more concerts than you could possibly attend. Since its founding in 1981, the Boston Early Music Festival has become one of the leading cultural organizations in Boston, a city not lacking in them. Its biennial festival draws performing groups and audiences from all over the globe. Its focus is on a historically informed Baroque opera - this year it is doing three! All three of Monteverdi's surviving operas in one week. What bliss. If you closed your eyes for the drive up to the Green Music Center in Rohnert Park, California, and then opened them when you arrived at Weill Hall, you might think you were at Tanglewood. This hall is modeled after Ozawa Hall in Lenox. Judy Collins, regal and still going strong at 75, packed the Sonoma Music Center. WAM Theatre, presents Claiming Her Place, a benefit to be held Sunday, June 30 at 7pm at the Mahaiwe Performing Arts Center in Great Barrington. Co-produced and hosted by Tony nominee Jayne Atkinson, the evening will feature a celebrity panel discussing the challenges women face in the entertainment industry. The panel includes: Lauren Ambrose (Six Feet Under),Michel Gill (House of Cards), Marin Mazzie (Tony Nominee), Linus Roache (Law & Order) and Debra Jo Rupp (That '70s Show). Handel wrote his first opera, "Almira," when he was only 19. Although it is no masterpiece, it shows at an early stage his gift for melody and his love of the high female voice. The renowned musical event comes to the Berkshires and Mahaiwe Performing Arts Center June 21-23. Mahaiwe Performing Arts Center in Great Barrington announces spring 2013. Highlights include a talk by author and illustrator Brian Selznick followed by a screening of Hugo, Masters of the Fiddle with Natalie MacMaster and Donnell Leahy, humorist David Sedaris , singer/mandolin virtuoso Chris Thile and jazz pianist Brad Mehldau , Cirque Shanghai: Bai Xi, Paul Taylor Dance Company , "Live in HD" broadcasts by the Metropolitan Opera, London's National Theatre, Wait Wait Don't Tell Me!, as well as classic movies. Close Encounters With Music introduces grand prize winners of the Tchaikovsky International Violin Competition and Arthur Rubinstein International Piano Master Competition in their Berkshire debuts; presents one of the preeminent Baroque ensembles, Tragicomedia, to usher in the holiday season; and adds another notch on its belt of successful commissioning projects with a new work by American composer Robert Beaser, who has written for Glimmerglass and New York City Opera. While not exactly an overhaul, Mark Volpe appears to be tweaking the programming at Tanglewood. Sticking with the mantra of Tanglewood as the summer home of the Boston Symphony Orchestra means facing the reality or an eroding, senior audience. The annual season ending Tanglewood Jazz Festival has been scrapped replaced by booking A list jazz artists Wynton Marsalis and Christain McBride in Ozawa Hall and Pops in the Shed for a boldy revamped Labor Day weekend. And that's not all. Berkshire Playwrights Lab will present the Berkshire Playwrights Lab 5th Season Gala Celebration on June 9 and staged readings of new plays on July 11, July 23, August 8, and August 22 at the Mahaiwe Performing Arts Center (14 Castle Street, Great Barrington, Mass.). In addition to a new short piece by David Mamet and performances by actors Jay Thomas, Treat Williams, and other plays and actors TBA, the Gala will include the premiere of Food for Thought, a short film. When Rocco Landesman, the head of the NEA, suggested that there are too many arts organizations with supply outweighing demand there was a response of outrage in the arts community. Here in the Berkshires it begs the question of sufficient audience and patrons to support four major theatre companies. It also begs the question of the role of critics? Are we just providers of consumer information for ticket buyers? Tommy sold out at the Colonial for the VIP opening on Saturday night. The reviews are staggering in, partly because some critics opted for an offer of better seats on Monday night. That doesn't give much time to promote an expensive show with a short run that ends on Saturday. We asked artistic director, Kate Maguire, about that during the opening night party. The Boston Early Music Festival North American premiere piece de resistance is the long-forgotten 17th century opera â€œNiobe, Regina de Tebeâ€. It travels from Boston to the Mahaiwe Performing Arts Center in Great Barrington on June 24 and 25. The rarely produced early opera is not to be missed. Michael Cassin, Director, Center for Education in the Visual Arts at The Sterling and Francine Clark Art Institute will present a free lecture on the Clark's major summer exhibition Pissarro's People on Thursday, July 7 at 7:00 pm at the Mahaiwe Performing Arts Center. In this special lecture, Cassin will introduce the people in Pissarro’s paintings. Lucky residents of the Berkshires â€œAcis and Galateaâ€ is coming your way with two opportunities to hear it. Be prepared for the singing of a lifetime and to pound your hands together until they’re raw. The BEMF’s production of Handel â€œpastoral entertainmentâ€ â€“ he didn’t call it an opera â€“ was the best I have ever seen.